Our raft inches toward the cliff-like drop and the resonating chorus of the rapids disappears. The only sound that remains is that of bystanders as they hoot-n-holler from the islands of rocks, a coliseum-like shelf that’s adjacent to the river. We’ve paddled the first eight miles of the Gauley River and our immediate river obstacle is Sweet’s Falls: A 12-foot tall cascade. The technical segment is a designated class V. Our Adventures on the Gorge raft guide, Jo Beth, sternly steers our boat with her paddles. Her eyes are glued to our gateway: the boat needs to plummet over the ledge and land in one spot, in order to avoid collision with the subsequent collection of rocks. Beth is completely calm—but I tighten my grip on the paddle and jam my foot deeper into the raft’s crease. Twenty seconds later, we’ve flown over the ledge. My heart spikes as we bounce-land. One paddler ricochets into the surrounding water, which is a gurgling spread of giant white plumes. Beth immediately grabs the woman’s personal flotation device (PFD) to pull her back into the boat. I’m here to experience the rowdy ride of whitewater rafting on the Gauley River—and it’s delivered on day one. I grew up rafting down rivers of the West including Colorado’s Animas River, Clear Creek, and the famous Royal Gorge along the Arkansas. Until last year: I learned about the annual Fall Gauley Season—a perfect complement to the spring whitewater season of the Rocky Mountains. Plus, it’s a sure thing. “We schedule a 5 a.m. release that allows a flow of 2,800 cubic feet per second every Friday, Saturday, and Sunday throughout Gauley season. The water raises at one foot per hour,” Toby Wood, Resource Manager of the U.S. Army Corps of Engineers, told me when I visited the dam the day prior to my two-day paddle trip with guide and outfitter Adventures on the Gorge. The Gauley season’s six-week window stretches from Labor Day through October, when the Army Corps of Engineers controls 22 flow releases of the Summersville Dam. The flow and back-to-back rapids is set in stone, which attracts whitewater experts and recreationists from around the country. 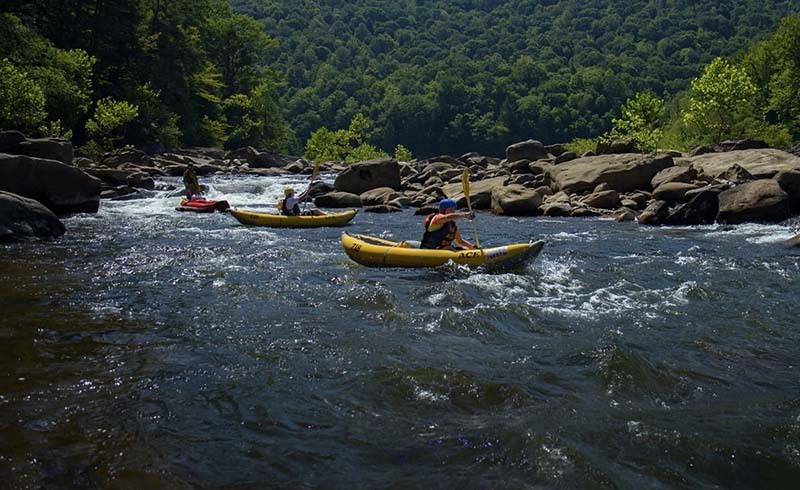 In a grand finale, Gauley Season wraps up with Bridge Day, West Virginia’s largest single-day festival, which is held on the third Saturday of every October. 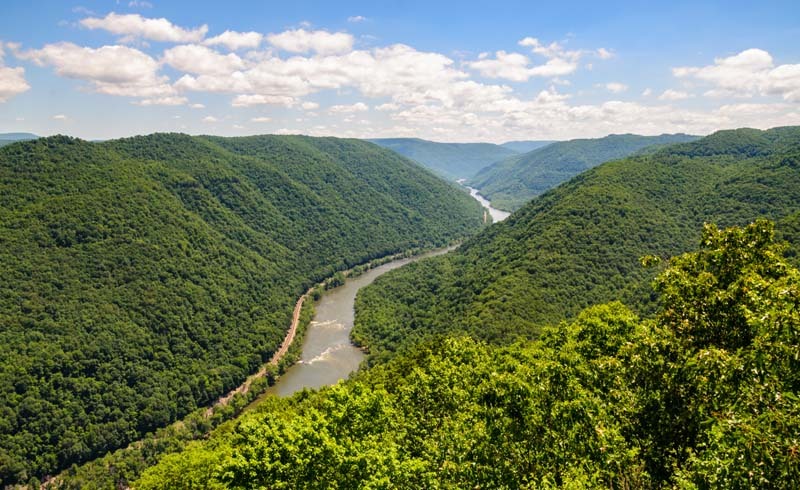 It’s also one of the largest extreme sports events in the world, due to the thousands of spectators and BASE jumpers from around the world who come to jump legally off of the 867-foot New River Gorge Bridge. Rappellers also ascend and descend from the bridge’s catwalk, like spiders dangling from a web. All considering, it’s easy to see why the Gauley River attracts expert guides from across the country. The 26-mile stretch of water is separated into the Upper and Lower: the former features five Class V rapids (on a scale of I to VI) and the latter strings together Class III through V rapids. Overall, more than 100 rapids appear, as the river drops more than 668 feet. To point, Colorado guide Julie Sutton has traveled to West Virginia every fall for more than a decade to guide the water during the Gualey season: “I paddle the Gauley, because it helps to extend my season (Colorado’s whitewater is contingent on snow melt and peters out by August) and you’re guaranteed whitewater every single time, because it’s dam released,” she said. Beth also returns to the Gauley each season and even helped to kick-off one of the country’s leading women’s whitewater competition teams, The Sweets of the East. The team is named after Sweet’s Falls, which was first dropped by a paddler named Sweets. Soon after Sweet’s Falls, we tie up the rafts at our midway camp, and Beth tells me why the Gauley is a goldmine to raft: “It’s a pool-drop river, which is nice so that you have a little bit of time between the challenging rapids before you drop into the next rapid. For the most part, there’s a good current. The pools are short. The rapids between the Class V are all Class III or IV. When you consider that the little in-between rapids could flip your boat, every rapid has potential for excitement,” she says. A fog snakes into the canyon, where we’re setting up our camp in Gauley River National Recreation Area. The paddlers peel off their wetsuits and booties, pitch their respective tents, and head to the wood-fired, riverside hot tubs. Following a soak, I bag my wet bathing suit, grab my fleece pants and jacket out of my pack, pull on my dry hiking boots from a second bag, and stroll through a vibrant green forest to the Adventures on the Gorge backcountry kitchen. A warm, gourmet, multi-course meal is being prepared by expedition chef Mary Brent Galyean, who has been featured on the Food Network. Sans electricity and running water, I watch Galyean juggle her mastery over a dozen diverse open flames. Our menu for the night warrants a double-take: Truffle-laced duck confit, white chocolate scallops, sweet potato and apple au gratin, and saffron almond blueberry basic cobbler. I fill my plate, sit by the fire, and talk beneath the stars with the fellow paddlers. Our camaraderie, and the most decadent backcountry meal I’ve ever experienced, warms my bones. I’m already eager for a second drop down Sweet’s Falls.